All members of Osteopathy Australia are AHPRA registered osteopaths with consistent levels of training in general osteopathic assessment, intervention, and treatment. In addition to general osteopathic training, some members of Osteopathy Australia have completed professional development and practice skill enhancement in a focus area. These osteopaths have further clinical skills for unique patient groups and needs. Osteopathy Australia’s Clinical Practice Groups (CPGs) are being introduced gradually from 2019 by consensus of the osteopathy industry. The CPGs exist for members who are either developing or have developed a clinical focus. Profession regulators, university course providers and members of Osteopathy Australia all informed the design of the CPGs. The CPGs provide pathways for osteopaths to become recognised along their career journey for the first time in Australia. Osteopathy Australia currently has CPGs established in five focus areas. Members have developed further knowledge and skill in movement instruction for patients, often with minimal hands-on manual therapy. Members aim to enhance physical abilities in patients seeking improvement in their general health, those who have sustained an injury, undergone surgery or experienced a loss of normal functional ability. CPG members develop clinical exercise programs either for individuals or groups to restore patient functionality to pre-injury capacity wherever possible, or support patients to adjust to life with a chronic illness or injury. Osteopaths within this CPG may provide exercise-based interventions in private practice, healthcare setting or within communities. Combinations between hands-on manual therapy and exercise prescription that may be effective. Members have developed further knowledge and skill in supporting injured workers to return to work or activity as early as possible post-injury, managing return to work risks, and improving occupational environments for health, function, and performance of duties. CPG members have skills in duty prescription, manual handling education, environmental modification, on-site task analysis, developing site-specific injury management protocols. These members provide ergonomics assessments and perform work task related tests to prevent workplace injuries, plan workplaces better and optimise efficient task completion. Manual handling and ergonomics best practice and can apply associated principles to individual workers, teams, occupational environments, and workplaces. Members have developed further knowledge and skill in normal development, physical and motor capabilities in children and young people. Paediatric CPG members aim to assist children with chronic conditions, other physical impairments, or difficulties relating to their growth, development, postures or movement. Social and psychological factors that may impact physical capabilities in children and young people. Members focus upon identifying and managing underlying causes of acute, ongoing or persistent pain which may be maintained through complex physiological and neurological factors unique to each person. Pain Management CPG Members have developed further knowledge and skills in assessing and managing complex pain types, such as nerve pain (pain that results from a disease or problem in the central nervous system but can exist without a physical injury), neuroplasticity (changes in the brain and patient behaviours or perceptions due to pain), pain comorbidities (when there are numerous types of pain present or other conditions that may produce or compound pain or disability). Complex pain presentations that may require additional attention or investigation. Members focus on musculoskeletal injury management and prevention in sporting contexts, as well as performance and physical skill management in sports. Members of the Sports CPG have developed further knowledge, experience and training in understanding biomechanical requirements in a sport or sports, applying related clinical assessment approaches, strengthening, conditioning and rehabilitation techniques. Referral frameworks, pharmacological and surgical interventions that may be applicable to musculoskeletal sports injuries. Each CPG requires applicant members of Osteopathy Australia to demonstrate learning, clinical reasoning, and skills aligned with broader healthcare industry standards in the focus area. For more information on CPG focus area standards, refer to the following links (hyperlink to quality practice frameworks). Members of Osteopathy Australia seeking recognition undergo a transparent peer review and validation process that seeks to verify access to relevant professional development, acquisition of skills and capabilities. Members recognised within a CPG are given rights to merits, titles, advertising privileges and awards in acknowledgment of standing. Three levels of skill are recognised in each CPG: Extended Practice Recognition, Advanced Practice (Titled) Recognition and Fellowship Level Recognition. Extended Practice recognition arrangements in each CPG will be progressively opened to members from 2020. Advanced Practice (titled) and Fellowship level recognition arrangements will be opened to members from late 2019. To find out more about what each level of recognition means or to start an application, follow the links below. Members of Osteopathy Australia recognised at the extended level of practice are committed to a pathway of clinical skill development in a CPG focus area. These members complete focus area professional development activities. The activities they complete enhance their clinical knowledge sets and practice skills beyond the typical skill level of graduates and osteopaths initially entering the area of practice. These members show that they are familiar with and can apply clinical assessment frameworks, intervention and management approaches indicated for musculoskeletal health management in the focus area. Members recognised at the extended level of practice have their standing revalidated every two years. Members of Osteopathy Australia recognised at the advanced (titled) level of practice have completed higher degrees or tertiary qualifications in a focus area in addition to osteopathic qualifications. These members are practice leaders for the focus area within the osteopathic profession in Australia. Their recognition represents the highest level of acknowledgement for practice skill enhancement. These members can apply multidisciplinary and interdisciplinary clinical skillsets that exceed the general osteopathic scope of practice and extended practice skillsets. 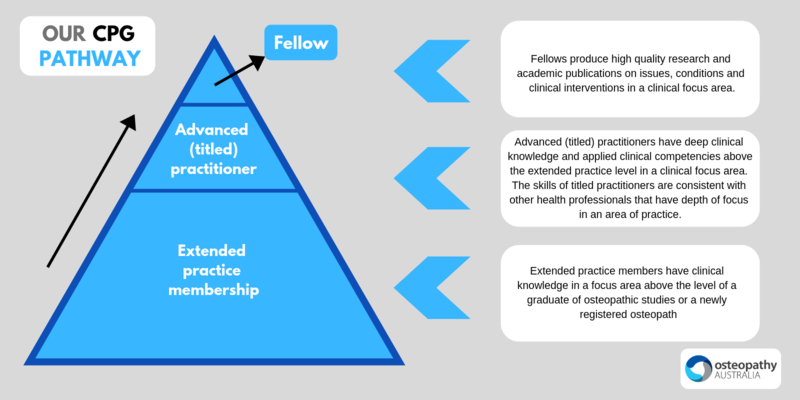 Advanced practice (titled) members possess skills broadly aligned with other health professionals who have depth of focus in a field of clinical practice. Advanced practice (titled) members show evidence of their dedication to providing quality clinical practice in a focus area. Access to a sticker logo for use to promote advanced titled practice standing at the physical location of a clinic. Members recognised at the advanced level of practice have their standing revalidated every two years. Fellows demonstrate substantial experience in knowledge creation in a CPG focus area through doctoral qualifications, high quality academic research, clinical publications and development of evidence-informed practice. Fellowship level recognition represents the highest level of acknowledgement for thought leadership, academic and theoretical contribution in a clinical focus area. It is distinct from advanced practice (titled) recognition, with advanced practice representing the highest level of applied clinical practice recognition. Access to a sticker logo for use to promote their fellowship at the physical location of a clinic. Fellows have their standing revalidated every five years.